Keywords: Backbone cyclization, cyclization, peptides, peptidomimetics, protein-protein interactions, therapeutic. 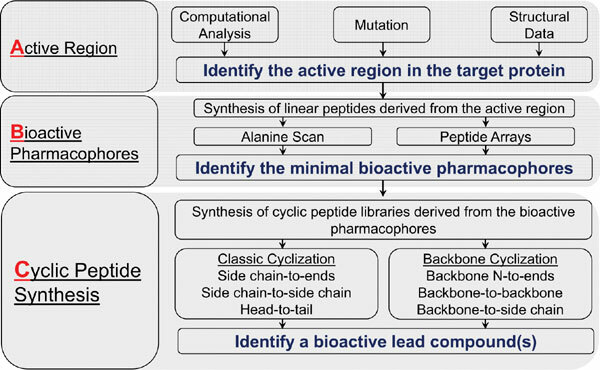 Title:Conversion of Protein Active Regions into Peptidomimetic Therapeutic Leads Using Backbone Cyclization and Cycloscan – How to Do it Yourself! Keywords:Backbone cyclization, cyclization, peptides, peptidomimetics, protein-protein interactions, therapeutic. Abstract:Protein-protein Interactions (PPIs) are particularly important for controlling both physiologic and pathologic biological processes but are difficult to target due to their large and/or shallow interaction surfaces unsuitable for small molecules. Linear peptides found in nature interact with some PPIs, and protein active regions can be used to design synthetic peptide compounds for inhibition of PPIs. However, linear peptides are limited therapeutically by poor metabolic and conformational stability, which can compromise their bioactivity and half-life. Cyclic peptidomimetics (modified peptides) can be used to overcome these challenges because they are more resistant to metabolic degradation and can be engineered to adopt desired conformations. Backbone cyclization is a strategy that we developed to improve drug-like properties of linear peptide leads without jeopardizing the integrity of functionally relevant side-chains. Here, we provide the first description of an entire approach for developing backbone cyclized peptide compounds, based upon two straightforward ‘ABC’ and ‘DEF’ processes. We present practical examples throughout our discussion of revealing active regions important for PPIs and identifying critical pharmacophores, as well as developing backbone cyclized peptide libraries and screening them using cycloscan. Finally, we review the impact of these advances and provide a summary of current ongoing work in the field.